How do you say goodbye in Danish? When my wife and I road-tripped through Spain in 2016, it was the longest time we’d spent away from home on vacation. That may sound quaint to the more well-traveled, but experience is relative. Neither of us studied abroad and our first time traveling to Europe was a year after our wedding. To us, circling almost all of Spain by plane, car and train would have seemed fantasy to the less-traveled us of ten years ago. We spent 16 days in cities like Seville and Málaga as well as smaller towns like Córdaba and Villabuena de Álava. So when we found out we’d spend nearly a month in Denmark, the vast majority of that in Copenhagen, we were flooded with excitement. It was to be a trip unlike any previous, less like a vacation as my wife would be there working on projects. It would be a new experience, living in an apartment instead of a hotel, waking to an alarm so she could head off to “work” each morning. We weren’t sure what to expect, but we knew it would be different and somehow magical. The experience was that and more. When I sat down to type this post, I had visions of a long-form story, the kind I really enjoy writing, and hopefully you enjoy reading. But as I began to formulate the story line, how things would work together, I had another idea. Instead of paragraphs dense with travel descriptors, I started thinking about the things I’d miss. The little things, the big things. The things that stand out like signposts in your mind. I wanted to bullet-point those things and commit them here as a reminder. Maybe five years from now I’ll look back at this and one of those bullet points will have been forgotten and it will be a reminder that makes me smile. If nothing more, maybe they’ll make you smile too and think about the little things you encounter that can often mean quite a bit in hindsight. • Mornings with my wife - Unlike vacations, there was no rush to get out the door to maximize sightseeing. Our mornings there were much like the ones in Brooklyn — the sounds of a running shower, of coffee beans being ground, and my wife sitting on the bedroom floor in her robe blow drying her hair. The sound of the rain and the work commute on Torvegade just outside. The ruffling of our coats as we headed out the door. The perfectly mundane mornings of us not being on vacation, but rather just living in Copenhagen. I’m going to miss that. • The commute - When you’re on vacation, it’s not a commute. When you live and work somewhere and it happens daily, it is. 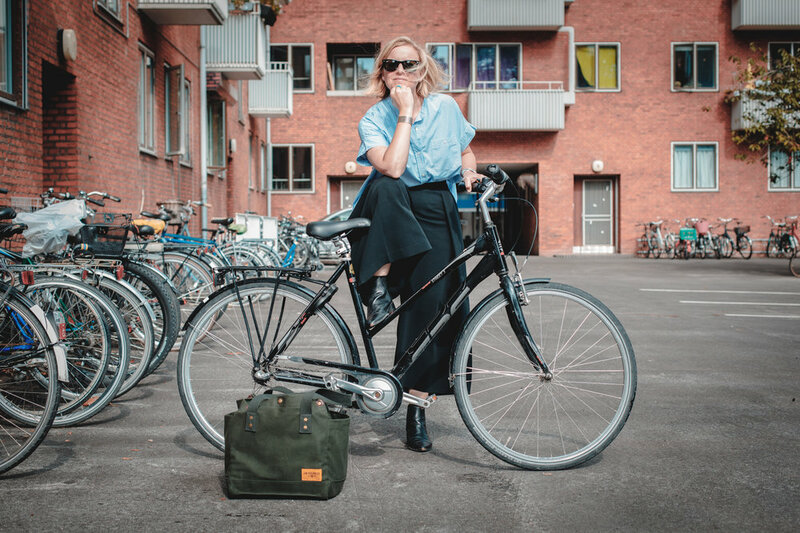 Each day, with the exception of two, we’d exit our building, unlock our bikes and start off on our 12 minute or so ride to either Noma for her residency, or Refshaleøen for the MAD symposium where she was volunteering. We’d chat on the ride, discussing what her day might look like and what my plans were, passing children heading to school as we did. We’d blend in with the other cyclists waiting at lights. We’d cross small, charming bridges over canals. It was merely the simple act of riding to see her off each morning. I’m going to miss that. • Life on two wheels - Speaking of the commute, we went everywhere on our bikes. We participated in a long-term rental, so we had bikes for the entirety of our trip. We knew from previous visits that Copenhagen’s main mode of transportation was bike, but I think we failed to realize just how much fun that can be. Not since I was a kid have I rode a bike so frequently. It was so different from my days on the NYC subway. And with Copenhagen not being a very large city, the bikes suddenly compressed it further and made everything seem reachable. There was a joy and a freedom to hearing the “clack” of the lock and the spring of the kickstand, knowing we’d be off, enjoying the abundant and spacious bike lanes. There’s a child-like joy to riding around a city every day, something that makes you feel young and alive. I’m going to miss that. • First day of school - I type that because we joked that her first day at Noma as a visiting artist had a very similar feel. Wardrobe was picked out, the day got off to an early start, and what awaited was still mystery, much like your first day of school. There’s a photo I took of her, posing on her bike, one leg confidently perched, just before we pedaled off. I wanted to capture it, knowing it would only happen once. I can only imagine the mix of anticipation, anxiety and wonder she must have been feeling at that very moment. She was realizing a dream that seemed implausible months earlier. At that point, we were riding off into the unknown. I’m going to miss that. • The frequency of friends - When you remain somewhere for a while, familiar faces show up more often. That’s tough to do on vacation as you’re rarely in one spot long enough. That familiarity, if you’re lucky, breeds friendships. On our third night we were invited out to dinner with Katherine Bont and Arve Krognes from Noma, an extremely kind gesture from them to welcome us in. We ate at Punk Royale where we met chef and co-owner Joakim Almqvist. We wound down the night over a bottle of wine and good conversation. It was a truly special start to our stay. Afterwards, we’d bump into the three of them at various restaurants and events, each time exchanging friendly smiles and hugs. Then there was Geoffrey Canilao. He runs Balderdash, a cocktail bar downtown. We met at Amass and exchanged cards. Next thing I know, we’re hanging out at his bar and he’s riding us around town in the front of his cargo bike. Later in the trip, we saw him at a couple of events and each time he greeted us like we’d been friends for years not days. There are others I could ramble on about—Andreas from Braw who I know from my early days of visiting Copenhagen, Stefanie and Johan at Barr, Devin at Noma (who helped arrange my wife’s time at Noma and for that we’ll be forever grateful), Søren from Dry & Bitter Brewing. We happily kept bumping into them. There was this feeling of being welcomed that you might not get if you’re in a place for a short period of time. I’m going to miss that. • Me time - I don’t mean that facetiously. When you vacation, you and your partner are often teamed up the vast majority of the time, taking in all you can before heading off on your next adventure. While there, my wife had work and I had the days to pursue personal projects, mainly photography. That meant she had her own experiences and I had mine. Often that included hopping on my bike and wandering. It meant lunches alone, talking to the waiters. It meant stopping into a coffee shop to have a cortado and edit photos. And all of it was in this new city, discovery at every turn. It’s a way to challenge yourself and a way to open you up to new experiences when you “fly solo” as they say. I’m going to miss that. • Leaving the map behind - Each day I relied on a map less and less. In the final week or so, I’d gotten so that I just hopped on my bike and went. Familiarity. Knowing which street to turn onto, which bridge to take. Like moving to a new city, that comes with time. And on this trip, we were afforded that time. I can distinctly remember the first time I hopped on my bike in Christianshavn and jetted across the city, bound for lunch at Mirabelle in Nørrebro, and then back without once resorting to the phone. The confidence you feel as you learn a place and how that makes you feel more at ease, more at home. I’m going to miss that. • The pop of the light bulb in our apartment lobby - This final one is a small detail, but one that will stay with me for some time. It was a sound that was confounding at first, then comforting. Whenever we’d return, whether it be from a quick trip to grab coffee or a night out with friends, the door would swing open in the apartment building, and as soon as we rounded the corner, the light would pop on with a muffled “bewp” sound, perhaps from the filament springing to life. For three weeks, I heard that sound each and every day, almost like the apartment greeting our return. On the last night, our final return to our apartment, I anticipated the sound, trying to etch it into my brain. Like a mother who waits up for a child who’s stayed out too late, we rounded the corner and heard it a final time. I’m going to miss that. Surely there are others. Minute details that dissipate into the mental fog as hours become days become months become years. But these little bits and moments, of just existing in a reality different from my norm, are what I think I’ll miss most. Until next time Copenhagen, hej hej.